Perhaps the reason the Eastern Cape has something of a Cinderella complex is because it lies wedged between two of South Africa’s most popular destinations – the Western Cape and KwaZulu Natal. Certainly it receives less attention than the Western Cape, yet is more diverse and harbours some of the most beautiful holiday destinations in the country. 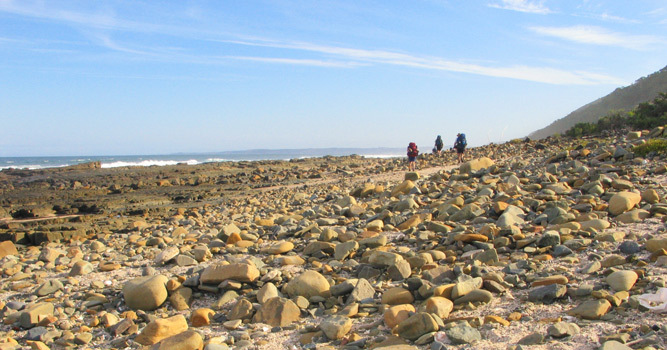 It begins where the Garden Route stops, 1 000 km of largely undeveloped coastline (if you overlook Port Elizabeth and East London) with beaches warmed by the Indian Ocean’s waters, its north-eastern corner dominated by the Drakensberg Mountain range and its eastern quarters awash with rural Xhosa villages. It has one of the country’s best loved national parks, is malaria-free, and is Nelson Mandela’s birth place. For visitors it is a playground of outdoor activities and compelling natural attractions. 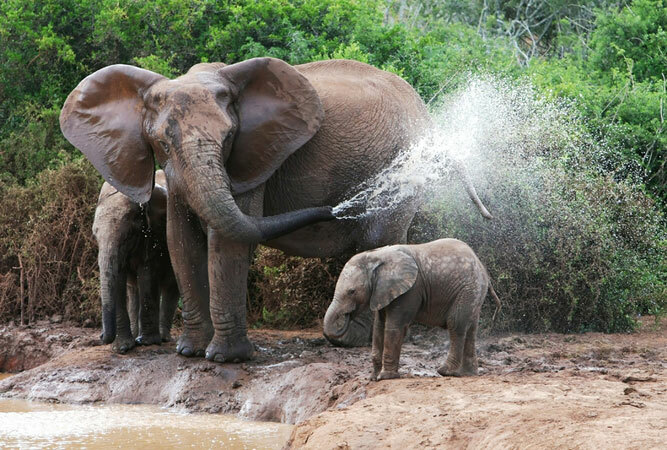 The third largest national park in the country, Addo stretches from the semi-arid Karoo through the Sundays River Valley all the way to the coast between the Sundays River and Bushman’s river mouths. 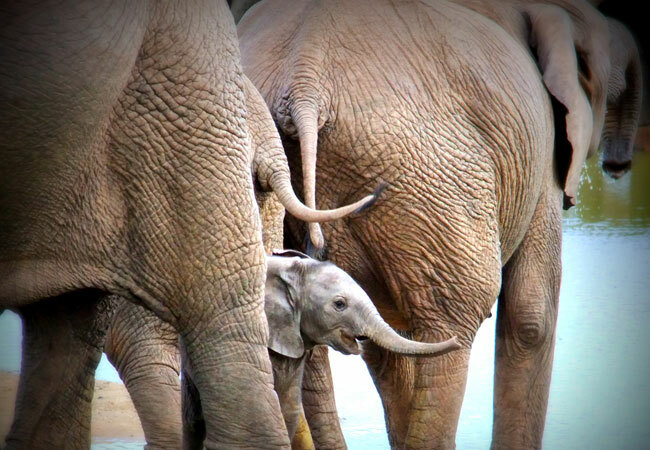 It is one of the best places in the country to see elephant and the reserve is home to one of the biggest African elephant populations on earth – 600 elephant – as well as lion, buffalo, black rhino, spotted hyena, leopard, and the southern right whale. 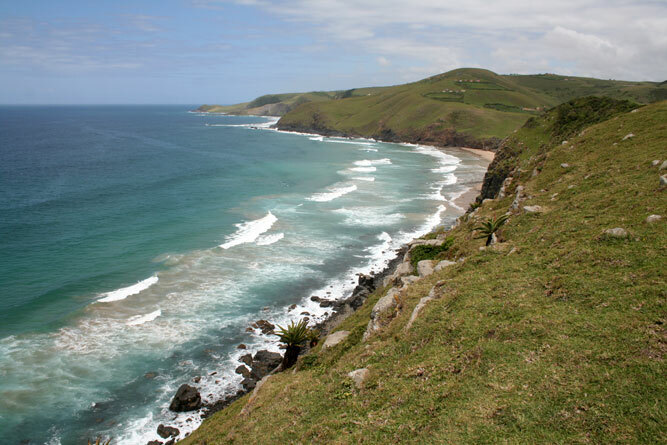 The Wild Coast is a glorious expanse of untamed wilderness that combines vast stretches of desolate beach, precipitous and craggy cliff faces, secluded bays and rolling green hills in what was formerly known as the Transkei. 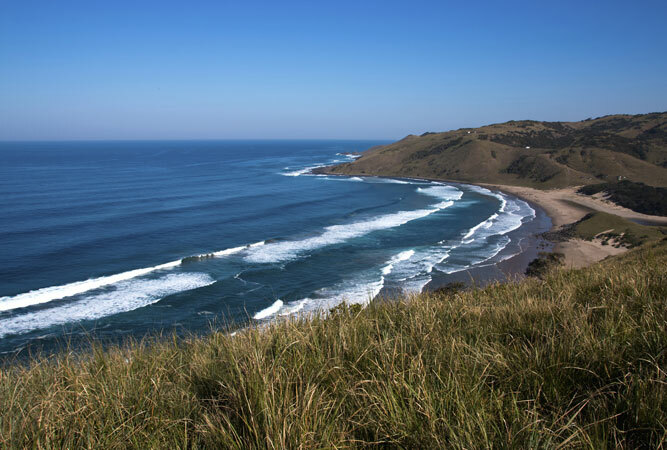 Its unspoilt beauty is one of the poorest regions in the country inhabited largely by the Xhosa people who still live in traditional rondavels. Any resort is isolated along winding dirt roads and you will need a high clearance vehicle to reach them. Once at your destination there is little other to do than stay put, hike and relax. The Baviaanskloof is a gorge that stretches for over 100 kilometres between the Baviaanskloof and Kouga mountain ranges. This wilderness area is the largest of its kind in the world, the unspoilt mountains a haven for outdoor adventurers. 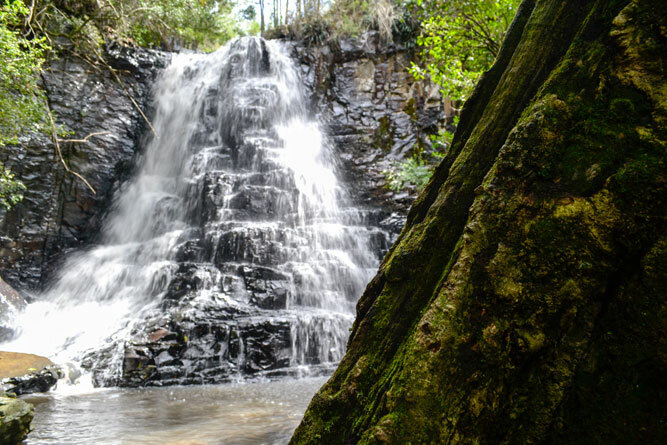 Its natural beauty and biodiversity, that includes seven of the country’s eight biomes, is a winning combination of veld, indigenous forest, mountain streams, cliffs, and waterfalls. The name alone should hint at the disturbing beauty of the Camdeboo National Park‘s most popular sight. 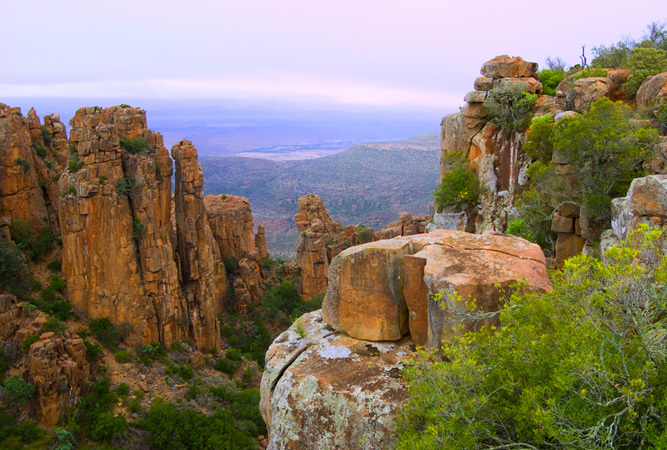 Dolerite columns defy gravity as they stand piled up upon one another against a backdrop of the flat Karoo plains. Their timeless beauty makes for breathtaking photographs that serve as a reminder of the inconsequence of our daily trivia. 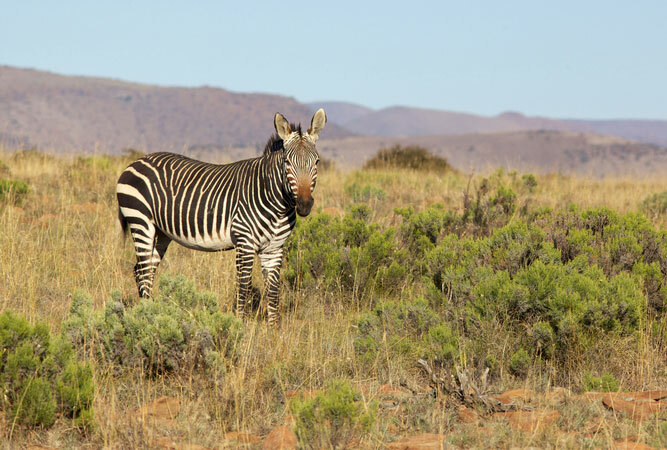 There are over 300 mountain zebras protected in this 28 000 hectare reserve, just outside Cradock (it is well signposted off the R61). One of the rarest zebra in the world these zebras come smaller than the usual zebra, with a reddish-brown nose and dewlap, or loose fold of skin, under the throat. The wide open spaces, the views over the Karoo, and the chance of sighting bat-eared foxes and black-backed jackals, only increase its attraction. Kenton-on-Sea, Port Alfred, St Francis Bay, Cape St Francis, Jbay – beaches famed for their warm water, rock pools, nature reserves, consistent sunshine, friendly people and laidback approach to life. 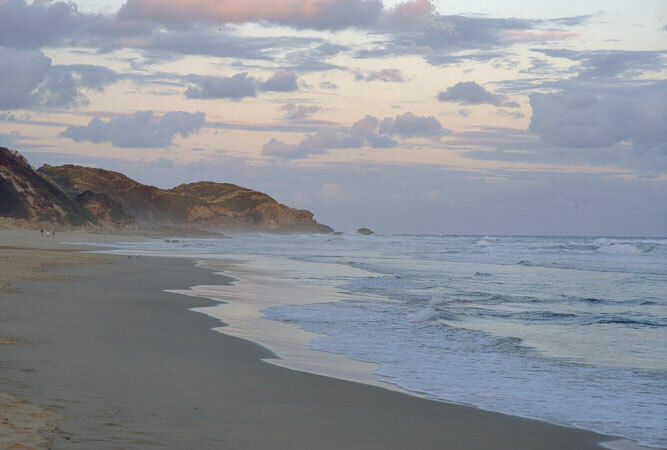 This 500 km coastline stretches from the Tsitsikamma mountains to East London, a series of villages, rivers, lakes, lagoons and surfing and swimming opportunities. Whether it is surfers after the perfect wave, or families seeking secluded downtime, this strip of coast is heaven. 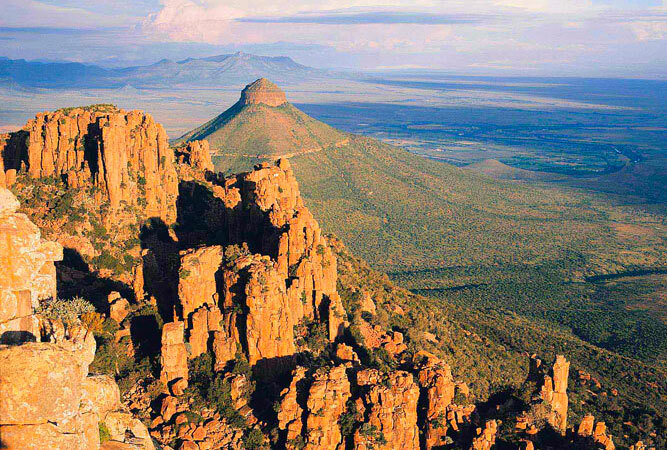 The bulk of the Great Karoo lies in the Eastern Cape. Largely sheep-farming country, much of this part of the Karoo is flat; an open vast emptiness that is difficult to describe unless you’ve been there, and so addictive once you have. The occasional little town is a mere blip on the horizon, whilst farmstays bring to mind scenes from Olive Schreiner’s The story of an African farm; unsurprising given that this is where she grew up. This is hobbit country (Lord of the Rings may have been shot in New Zealand, but there are those who argue that, despite returning to England with his mother and brother when he was only three years old, he was supposed to have visited Hogsback; enough to have been inspired to create his fictional Middle Earth based on the village). 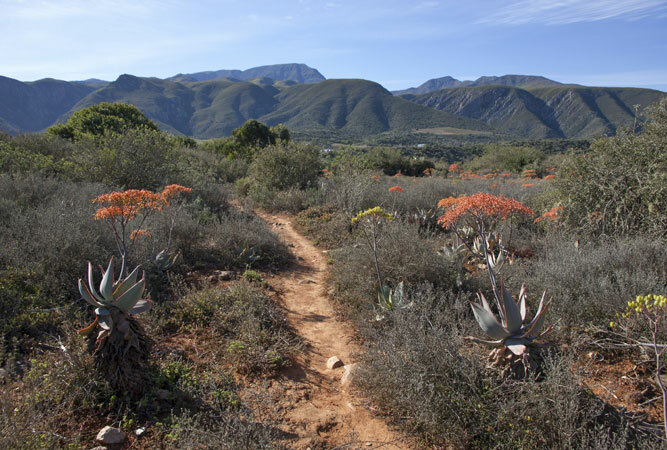 The mountains are covered in pockets of Afro-montane rainforest that form the backdrop of the Amatola Hiking Trail. 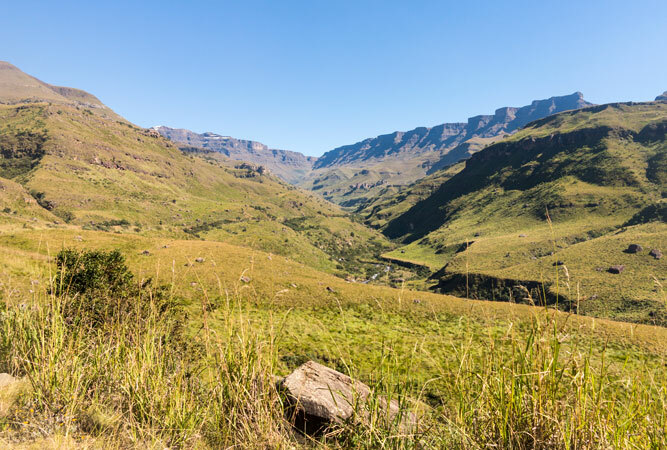 The Drakensberg of the Eastern Cape is the most southerly section of this extensive mountain chain that stretches from the borders of the Eastern Cape, KZN and Lesotho all the way to Mpumalanga. The Eastern Cape’s northerly reaches are dominated by this ‘barrier of spears’; the little farm villages of Lady Grey, Barkly East, Ugie, Maclear and Rhodes given to snow in winter. Forays into the southerly section of the Drakensberg are arranged through farms and reserves in the area. The Great Fish River reserve lies just outside Grahamstown, a semi-arid bushveld reserve that preserves the largest single tract of sub-tropical thicket in South Africa. The reserve has plenty of game – a couple of elephant, over 200 buffalo, zebra, 700 (!) warthog, and various antelope, but they are difficult to spot between the spekboom and acacia trees – two predominant thicket plants. It is the views over the river gorge that are the real draw card to the Great Fish River Reserve.